Add a piece of Greece on your Christmas tree! This round Glass Ornament features a drawing of Santorini and the inscription Greece. 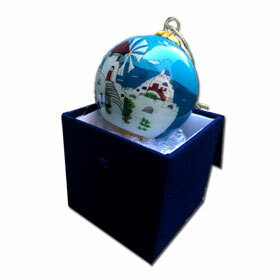 Ornament comes in a stylish blue presentation box that can be used to store the ornament when it is not decorating your Christmas tree and protect it for enjoyment next year.